For every sin, there's a price. Beverly Hills, CA - For Jack Molloy, crime was the only life he's ever known. But when a life-changing event steers him onto the straight and narrow, he'll soon realize that no one can truly escape their past. 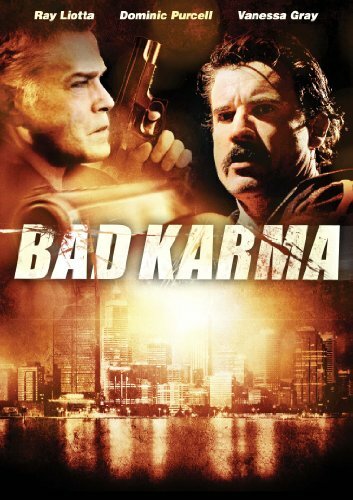 From the producers of I Spit On Your Grave and Flawless comes the action-suspense thriller, Bad Karma . Starring Emmy(R) winner and Golden Globe(R) nominee Ray Liotta (Goodfellas, Hannibal, Breathless), Dominic Purcell (Blade: Trinity, "Prison Break"), Andy McPhee (The Condemned, Animal Kingdom), and Vanessa Gray ("The Strip"), Bad Karma arrives on DVD September 11th from Anchor Bay Films. SRP is $26.98, with pre-book on August 15th. Anchor Bay Films is unique in that it offers the creative community a fully integrated distribution capability on all platforms and an international solution extending beyond the U.S. Anchor Bay Films is a division of Anchor Bay Entertainment and is on the ground providing quality distribution with operations in the U.S., United Kingdom, Canada and Australia, as well as distribution capabilities in other key territories. The company focuses on a platform release strategy for its films with an eye toward maximizing their potential across all ancillary distribution platforms. Recent theatrical releases include High School starring Adrien Brody and Colin Hanks and Seeking Justice starring Nicolas Cage, January Jones and Guy Pearce. Films in its library include the critically-acclaimed comedy City Island starring Andy Garcia and Solitary Man starring Michael Douglas as well as the 2011 releases of Kill the Irishman starring Ray Stevenson, Vincent D'Onofrio, Val Kilmer and Christopher Walken, Toronto Film Festival award-winner Beautiful Boy with Maria Bello and Michael Sheen and Cannes 2011 premiere Corman's World. Anchor Bay Entertainment is a subsidiary of Starz Media, LLC which is an operating unit of Starz, LLC, a wholly-owned subsidiary of Liberty Media Corporation.